Bacon, M. A. Winged Thoughts. London: Longman & Co., 1851. The binding is designed by Owen Jones and is different on front, spine, and back. It was executed by the firm of Remnant and Edmonds, and was created with relievo binding, where the design is embossed in leather in relief. Chapman, John K., ed. 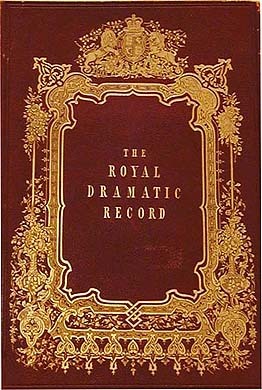 The Court Theatre and Royal Dramatic Record. London: Chapman and Company, ca.1849. Roan leather embossed with sand grain, blocked in gold and blind on front, spine, and back. Roan was thin sheepskin dyed and embossed to look like morocco (fine goatskin). 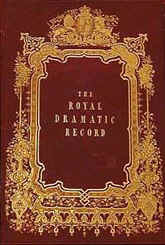 The cover design is a wonderful example of the extravagant use of gilt decoration. 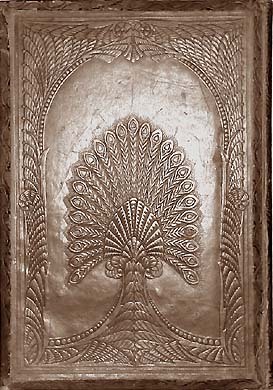 The next four bindings are good examples of the sculpted look, made possible by the invention of large, very powerful hydraulic embossing presses. These patterns were often highlighted by extensive use of gold and colors. Bloomfield, Robert. 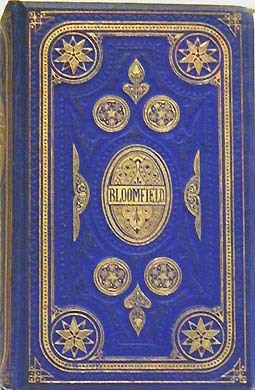 The Works of Robert Bloomfield. London: Routledge, Warne, & Routledge, 1864. Blue sand-grained cloth, beveled boards. March, Daniel. 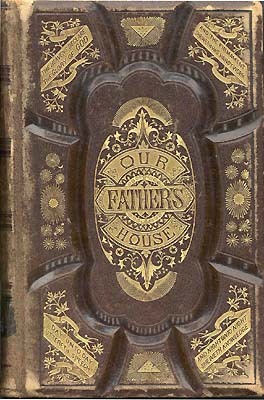 Our Fathers House, or the Unwritten Word. Philadelphia: Zeigler, McCurdy & Co., 1870. Brown leather, with beveled boards. Milton, John. The Poetical Works of John Milton. London: George Routledge and Sons, ca.1880. Blue-gray cloth, with beveled boards. 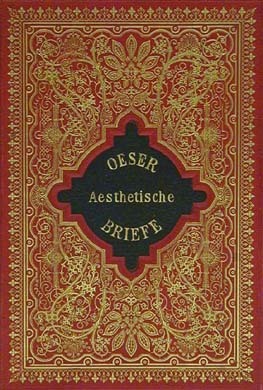 Oeser, Christian. Briefe an eine Jungfrau �ber die Hauptgegenst�nde der Aesthetik. Leipzig: F. Brandstetter, 1892. Red cloth deeply embossed, blocked in gold, black, and blind on front, gold on spine, and in blind on back, with beveled boards. 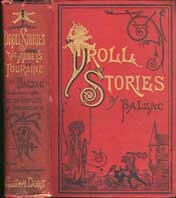 Balzac. 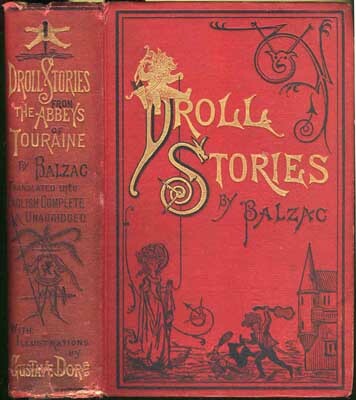 Droll Stories Collected from the Abbeys of Touraine. London: William Mitchell and Company, ca.1880. Red cloth blocked in gold and black on the front and spine. 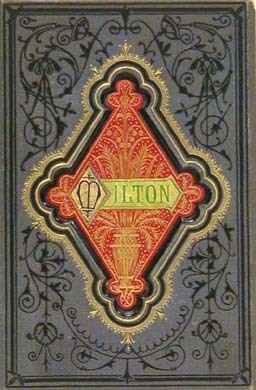 Cover design after the illustrations by Gustave Dor�.